First impressions matter, especially with job descriptions. With more than 20 million jobs listed on Indeed, it can be easy for your listing to get lost within all of those job posts. A great job description is your chance to connect with potential candidates. A quality job descriptions should be engaging and inclusive, not full of lengthy, dull text and descriptions between 4,000 and 5,000 characters have the highest click-to-apply rates, according to Undercover Recruiter. 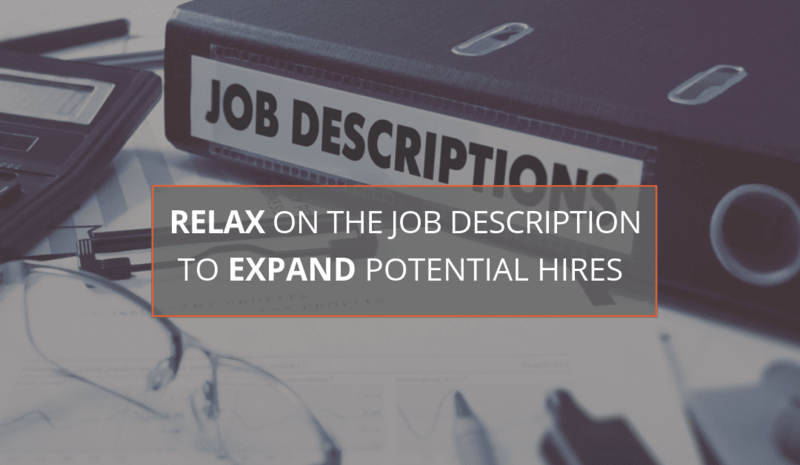 In a tight hiring market, it’s time for employers to relax on descriptions in 2019 to prompt qualified talent to apply and help trim down your time-to-fill. “The typical web reader will only read 20% of content and job seekers spend an average of 30 seconds on each job post, according to Proven. This means you want to write a job description that gives you a competitive edge. Here’s how to ensure maximum search visibility and find the right candidate for your role while also creating a great first impression with your job description, even when fewer candidates are looking for jobs. Make your job titles specific. Targeted job titles are more effective than generic ones, so be precise by including key phrases that accurately describe the role. Expand abbreviations, especially in titles, or else you’ll risk not having your job show up in searches. Job titles with 50-60 characters outperform others by 30-40%, according to Proven. Avoid internal jargon that could confuse the job seeker. Stick to standard job title terms. If you are using non-traditional and unclear job titles, you’ll likely attract the wrong people and miss out on qualified candidates. For example, Proven says, if you are hiring for an “Administrative Assistant”, don’t instead use “Office Assistant”. Using the job title like “Office Assistant” will automatically cut your search traffic by a significant factor. Open with a strong, attention-grabbing summary. Remember, this is your sales pitch to potential candidates. The summary should provide a clear overview of your company and expectations for the position. Effective job summaries are professional and relatable. Candidates tend to skim job descriptions, so confusing phrases will turn them off. Hook the job seeker with details about what makes your company the best place to work for. Include details about your company culture. Feeling comfortable within the workplace environment is as important as skills and experience are to a new hire’s success. Offer professional development to help a promising candidate strengthen their skills. Do you have a happy hour every Friday? Do you have a unique company tradition? If so, let the job seekers know! A desirable culture will attract better candidates that match your company’s culture and will also make candidates work hard to impress you during the hiring process. Include an exact job location. This will optimize your job posting, so it appears higher in job search results. Focus on a handful of essential requirements and remain flexible on the rest. Unrealistic requirements are off-putting, and you may not need to include them. Keep your list concise. It is tempting to list out every requirement but going overboard could divert potential candidates. Monster did a study where they demonstrated that job ads that bold the important parts, such as skills and requirements, receive twice as many applications as those that do not. Also, in a study by TheLadders, they were able to show that job seekers tend to ignore the skills and requirements section. You might as well make it as easy as possible to read and use bold to draw attention. It’s important for HR and Hiring Managers to be on their A game during today’s tight labor market. A well-written job description that offers clearly presented details, combined with company highlights, can make all the difference. If you find that you’re struggling to get qualified candidates, reach out to a recruiter for help. Recruiters have a wealth of knowledge of the local hiring market and can lead you in the right direction when it comes to aspects of the job description that might be problematic. If you are interested in working with one of our recruiters, but you are not sure what to expect click here.